Jesus’ model of leadership can be similarly disorienting. How did we wind up in such a strange place with a person who looks nothing like we imagined? 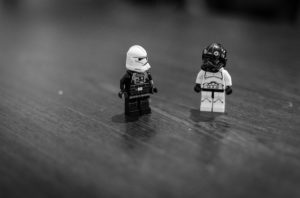 Like Luke Skywalker, we often look for a powerful example to emulate, a “great warrior” leader. And, like Yoda, Jesus has to gently remind us, “War does not make one great.” Our expectations are upside down. For Jesus, leadership means being a lead servant. The apostle Peter learned the hard way the radical nature of Jesus’ understanding of leadership. At the core of that learning and personal transformation was Peter’s experience as “a witness of the sufferings of Christ.” Like many of his contemporaries, Peter was looking for another great military leader like King David. How else were they to be freed from the brutal occupation of Rome? Instead, Peter saw Israel’s promised Messiah accused of treason and blasphemy. Rather than defending himself against those unjust charges – to Peter’s great horror – Jesus willingly embraced them and was summarily executed in the most violent and inhumane way the Roman Empire could devise. For many Christians, Jesus’ death is the tragic consequence of humanity’s opposition to God’s good intentions. While that is true, focusing primarily on the redemptive element of Jesus’ death makes it easy for us to lose sight of another, equally significant dimension. Jesus’ death is also the most powerful example of a new vision of human leadership. Instead of leadership being associated with privilege, coercion, and fear, leadership in the way of Jesus becomes about sacrifice, persuasion and love. The two models of leadership couldn’t be more different. Not surprisingly, moving from one model to another involves considerable disorientation and disruption. Not only is Jesus’ way antithetical to what we have learned, but we quickly discover that even our capacity to follow Jesus’ example is compromised. In the language of the Christian tradition, we discover that we are not sinners because we sin, but we sin because we are sinners. We not only need a new model and a compelling example, but a changed life. Toward the end of Luke Skywalker’s Jedi training with Yoda, Luke is confronted with an apparition of Darth Vader, the very embodiment of evil. In the ensuing light saber battle, Luke apparently defeats and decapitates Vader, only to discover the image of his own face behind Vader’s mask. Luke discovers himself to be his own worst enemy. The apostle Peter had a similar moment when confronted with his own denial of Jesus. In his greatest challenge, he saw his greatest challenge. Peter came to understand deeply something that the Catholic thinker, G.K. Chesterton, captured in his response to a question posed by an English newspaper. The newspaper asked, “What is wrong with the world?” To which Chesterton allegedly wrote, “I am.” No amount of self-knowledge, will power or courage is ever enough to overcome that most personal of enemies. Peter, along with all of humanity, needed and still needs the personal transformation that Jesus alone can provide. Encouragingly, that shocking discovery of Peter’s own failure was itself the first step to that transformation. And, as Jesus himself prayed for, Peter learned well from his Master. “And you, once you have turned back, strengthen your brothers.” (Luke 22:32) In my next set of reflections, we will look at what Peter learned and passed on to the leaders of Jesus’ newly formed human community, the Church. What do you admire about the great leaders you know? How do those characteristics compare with Jesus’ leadership as you understand it? In what ways do you find Jesus’ example of leadership disorienting? What do you think of G.K. Chesterton’s response to the question, “What is wrong with the world?” Do you agree with Chesterton’s assessment? Why or why not? This devotional has been updated from when it was first published on May 21, 2016.